It's impossible not to notice that Bath is a marvellous city for museums. This one is a treasure house of items from the collection of Sir William Holburne, including silver, Old Masters, Italian bronzes, porcelain, majolica, miniatures, and much more. Sir Thomas (William) Holburne (1793-1874) was a naval officer. He was the second son of a baronet and only gained the title after his elder brother Francis died at the Battle of Bayonne in 1814. Holburne lived at 10 Cavendish Crescent in Bath from 1830, with his three unmarried sisters. During his time in Bath, Sir William augmented family collections of porcelain, silver, and art with his own collections of Italian majolica, bronzes, miniatures, books, furniture, Roman coins, gems, snuff boxes, enamels, and seals. In 1882 Holburne's wide-ranging collection was donated to the people of Bath by his sister, Mary Anne Barbara Holburne, with the intention that it should form the core of a museum of art. The museum opened in 1893 and has since expanded its original 4000 items with a further 2500 artefacts, primarily in fine furniture and painting. One of the museum's highlights is its collection of 18th and 19th-century British paintings and miniatures. Part of this collection includes works by Gainsborough, Stubbs and Turner, donated by Ernest E. Cook, grandson of Thomas Cook. The museum is usually open daily except for 24, 25, 26 December and 1 January. Free admission but there may be a charge to view special exhibits. 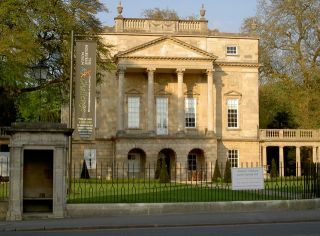 Editor's note: we had the pleasure of visiting the Holburne Museum on our first visit to Bath almost two decades ago. It was one of the highlights of our trip. The setting is superb, and the collection is beautifully displayed.